SOT Archaeological Prospection is one of the leading companies in Spain in the application of the most up-to-date georadar data processing and visualizing software for Archeology, Engineering and Urban Planning. “SOT Archaeological Prospection makes use of geophysical surveying to get non-intrusive images of the subsoil and provides the archaeologists with an estimation of the archaeological potential of a site or with the evaluation of the impact of a civil engineering project on the heritage. We use magnetic, electric and radar methods to acquire data. Data acquisition can be distorted by different anomalies: band effects, variations due to a break in the survey, change of user, uneven field, which generates unstable data. We have chosen Isatis to filter out our maps because its numerous tools for data analysis and interpolation allows tuning data processing to the acquisition conditions. Furthermore, I’ve been using Isatis for oil seismic data processing for 3 years. As geostatistical methods turned out to be really efficient for data quality control and filtering, I’ve naturally chosen Isatis when trying to apply these methodologies to geophysics applied to archaeology. On the other hand, to assess what the benefit of an advanced interpolation technique would be in data interpretation. 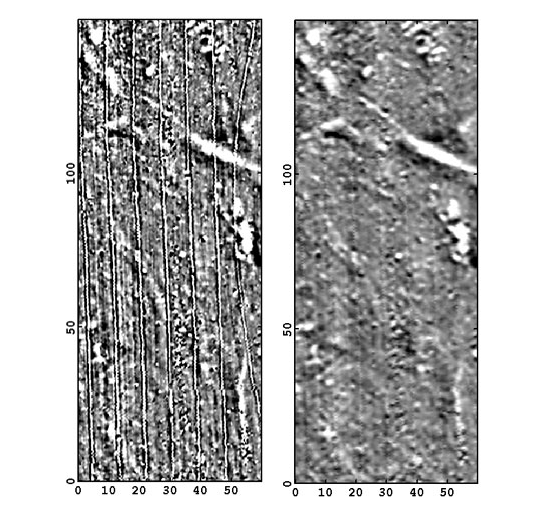 Besides its geostatistical functionalities, Isatis versatility allows us to reproduce most of the usual process in geophysics applied to archaeology. Isatis Exploratory Data Analysis was particularly helpful thanks to the interaction it allows with data. Areas of interest and problematic data could then be analyzed and processed very easily.